At the beginning of mating season, males from every species have their work cut out. Some males prepare to spar with other males as females watch and await her victor. However, male birds tend to be more lovers than fighters when it comes to courting, and some of them are the champions of woo. The brighter the male, the more attractive they are to the female. Male birds will boast their colorful feathers by puffing and preening. 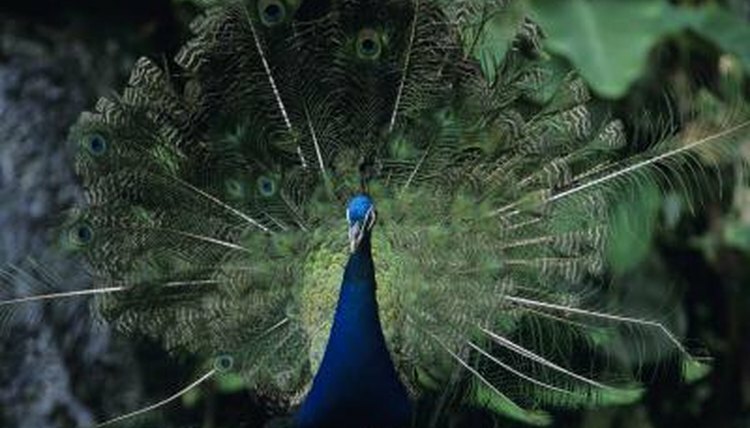 However, when it comes to truly showing off, the male peacock is hard to beat. Their blue and green iridescent tails can spread out more than 60 percent of their body length. During courtship, males will arch his large train so that it reaches across his back and touches the ground. It’s believed females choose by the size, color and quality. The successful male often wins more than one girl. Although male birds often gather supplies for a nest, in most species the female is the primary builder. Female snow buntings build the nest, but she is picky about her real estate. Males arrive at mating grounds four to six weeks prior to females. They do this to establish their territory, and show the female they have the best nesting site. Male European house wrens, however, prove their suitability as a mate by not only building the nest, but by building an average of 10. If a female shows interest, he will adjust the construction until she’s happy. When it comes to appeasing a female’s eye for design, bower birds impress even human researchers. Males build intricate and finely crafted tunnel-like avenues made with woven twigs on the ground. These are not nests. They’re sights of courtship. Males place trinkets down for the female that may consist of fruit, flowers or shiny objects. They even color coordinate. Satin bower birds for example have dark blue plumage. Since females are attracted to blue, he might present her with blueberries, blue stones or even blue bottle caps. If a female isn’t in sight, a male will call to get her attention. Songbirds typically do more singing than calling, and the mating ritual of northern cardinals is particularly sweet. Since female cardinals are one of the few female birds who sing, if she approves of the male, a duet will ensue. New Guinea’s male birds of paradise are famous for their elaborate mating dances. However, species of manakin birds have a few smooth moves of their own. They slide up and down a tree branch in a dance resembling a moonwalk.